Pallavika Nursery is a great source of gerbera. Gerbera plants have been hybridised for produce some of the most colourful flowers available for sale, some with almost a luminous quality. They are widely sold for cut flowers and are eye catching in the garden. Gerbera plants look like big daisy flowers and modern cultivars have larger flowers and some are double or semi double in form. As cut flowers they are long lasting and have long stems, great for vases. 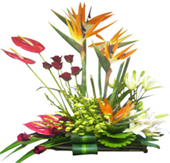 We are the largest seller of Bird of Paradise(B.o.P.) in Uttarakhand. The scientific name for the Bird of Paradise plant is Strelitzia Reginae Aiton. The flower is known both for its shape – which looks like the head of a bird — and for its deep orange and blue colors. The scientific study looked at the fruit of the plant, however, which is pale and overshadowed by the showy flowers. When the fruit matures, a capsule full of bright orange seeds breaks open. Scientists say the color of these seeds can stay the same for decades after the plant dies. Our goal is to offer an excellent quality rose at a reasonable price. All roses are guaranteed to be strong, healthy, and true to variety. We offer so many varieties of roses, available for mail order shipment. Pallavika Nursery prides itself in growing some of the finest roses anywhere. From cutting to finished roses, you can not beat the quality and care given to a Pallavika's Rose. Water lilly and Aquatic plants (water plants) are an essential element in any garden pond. Water lilly is a floating plant that grow best in slow moving water or ponds where the roots can establish in silt. Water lilies do require a fair amount of sun to grow and flower properly. Our goal is to offer an excellent quality water lilly at a reasonable price. Water lilies come from two families Nymphaeaceae and Nelumbonaceae or Lotus. Nymphaea alba is a white waterlily for cooler climates, Nymphaea 'Aussie Blue' is a blue lily suitable for tropical climates.